Last week Digest Issue 13 "Tale of Three Lines [Charts]" included the three currently most relevant charts for tracking the progress the S&P 500 Index since the March 2009 bottom. This week's Digest adds some additional details about trends in general and using options strategies. Trendlines are one of several methods used to help identify trends. Beginning with the rules for a correctly drawn trendline. For uptrends, draw a line from the lowest low, up to the highest minor low point preceding the highest high so that the line does not pass through prices in between the two low points. 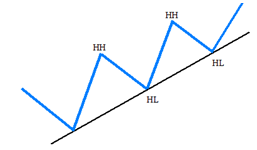 For downtrends, draw a line from the highest high point to the lowest minor high point preceding the lowest low so that the line does not pass through prices between the two high points. Based on this trend following method means pullbacks toward the trendline are buying opportunities, as they turn higher. Any pullback exceeding the new trendline signals caution until the next new high when the next new trendline will be determined. Trendlines usually provide support on pullbacks and resistance after recovering from previous closes below the trendline. When a subsequent new high is not reached the uptrend is considered broken. With respect to options, understanding the relationship between trending markets and option pricing is desirable and perhaps even necessary to gain an edge when trading trending markets using option strategies. The popular options pricing models include variables for the current price of the underlying security, the exercise price, time to expiration, interest rates, dividends and a catch all value called “implied volatility” derived by observation from actual option prices. Although prices often trend, there is no explicit variable in the models for trend. The models assume prices randomly go up one day and down the next. Further, they assume the magnitude of the up and down moves are log normally distributed where the daily price changes cluster around the average. By deriving a value for implied volatility from the actual option prices, asks it to carry a heavy burden. For example, when there are more buyers than there are sellers for options or anything else, prices increase causing higher implied volatility. However, implied volatility can also increase due to the relative bargaining power between buyers and sellers. For example, market makers will attempt to keep prices high enough to cover their added risk of making two-way markets especially when the trading volume is thin. In addition, implied volatility has a tendency to decline as the underlying securities trend higher and inversely increase when the underlying securities decline, reflecting a change in the risk assumptions by those who are anxious to pay higher put prices for downside protection. Therefore, implied volatility assumes by default the task of encapsulating all of the unknown variables determined by the option prices, including any imputed trend component. After October 1987, a noticeable change occurred as option prices adjusted to reflect more down side risk than had been assumed in the option models. That October decline, calculated to be more than 20 standard deviations, was an impossible move by contemporary statistical methods. In fact, large declines, defined as more than 20% have occurred 5 times more often than the models predict. As a result, to compensate for the increased downside risk, out-of-the-money put prices are now higher. This means put implied volatility tends to increase as the delta and strike price decreases making out-of-the-money puts relatively more expensive than the Black-Scholes model predicts. Because the arbitrage process maintains put-call parity between the option prices for the same strike price relative to the underlying price, in-the money calls will then be more expensive. On the other side, as out-of-the-money calls are sold, for both downside protection and for additional income, call prices are pushed lower, and once again, due to put-call parity, in-the-money put prices decrease as measured by implied volatility. Interestingly both sides of the skew change by the amount and the manner that downside protection is bought. 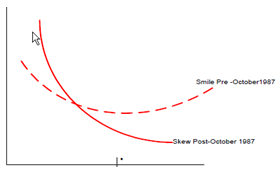 The degree of the method used the most determines the shape of the volatility curve or “volatility smile.” More out-of-the-money put buying changes the volatility smile causing the left side to rise. The chart below illustrates the before and after 1987 volatility smile for the S&P 500 Index. at-the-money center marker * and out-of-the-money call strikes on the right of the center marker. In summary from a trend perspective, out-of-the-money calls tend to be less expensive than suggested by the options models, while out-of-the-money puts tend to be more expensive. This also translates into falling implied volatility in uptrends and rising implied volatility in downtrends. The most money can be made when markets are trending and some say markets trend only fifteen percent of the time, but this most likely varies depending upon the market and the point chosen to begin defining the trend. However, individual stocks, sector ETFs and futures can be trending while the overall market remains range bound. First, the term trend defines the direction of the market as it makes a series of peaks and troughs. Here are some popular methods used to identify trends. Once understood, the trendline defined above is one of the simplest and easiest to apply methods for trend determination. Channel lines are a trendline variation formed by adding another trendline to the upper boundaries for both uptrends and downtrends forming a price channel that is useful to help identify possible overbought and oversold conditions as the trend progresses. Moving Averages in their various configurations are popular since they are easy to apply and are widely available in most technical analysis software programs. Easily quantified, they are also the basis for many mechanical trend following systems. The 50-day and 200-day Moving Averages are often used. The Average Directional Movement Index or ADX developed by J. Wells Wilder is another trend following method found in many widely used technical analysis programs. It identifies a trend and produces trading signals based upon the crossing of +DI and –DI indicators. Economics uses regression models to determine a line of best fit using the least squares method to calculate a line that minimizes the sum of the squared deviations of the data points producing a regression line. Although a breakout system, Point & Figure Charting is another method used for trend identification especially as a new trend develops after a period of price congestion when no clear previous trend has been evident. A breakout of the previous congestion area creates a breakout or breakdown alert depending upon the direction. In addition, by combining multiple trend criteria, complex systems are available to facilitate trend identification. IVolatility developed a handy Stock Sentiment Ranker to use when searching for trend ideas, either bullish or bearish. It combines price change, with support and resistance, call/put ratio, exponential moving average, relative strength and money flow along with stock specific filters to find potential trend candidates. More information about the Stock Sentiment Ranker is available in the user’s guide. Regardless of the trend identification method selected, a time frame needs to be determined, from 5-minute bars for day-traders, to weekly bars for long-term position traders. For equity option strategies, daily data with a one-year look back seems about right. In the Digest, when referring to the upward sloping trendline, labeled USL on charts, refers to find properly drawn trendlines using the method described above. In addition to their simplicity, they often pass right through price gaps confirming the trendline was valid and has subsequently been broken. By combining trends with option strategies, facilitates creating a basic options playbook for both uptrends and downtrends. When stocks, ETFs and indices are in defined uptrends their implied volatilities tend to decline as they work their way higher. Ideally, the uptrend will last weeks and hopefully even months. From the Volatility Skew section above, recall out-of-the money calls have a tendency to be underpriced so for uptrends look to buy out-of-the money calls. However, to avoid assuming the risk of declining implied volatility or the loss of time value, sell another farther out-of-the money call creating a call spread, long one call and short one or more others to hedge both the implied volatility and time decay risk. Once again referring to the Volatility Skew section above, since out-of-the-money puts generally sell at higher prices in implied volatility terms, look for a put to sell. Except in extraordinary circumstances, such as a takeover, look for a put with an implied volatility of at least 30 or higher. In addition, since time value of the put option declines at a rate defined as the square root of time, use near term puts that will quickly decline in value. Adding a put sale reduces the cash cost of the spread while adding net delta, or the amount the value of the option changes as the price of the underlying changes. In selecting the put, try to find one that is above a well-defined previous support level. Some refer to this strategy as a call spread risk reversal. In summary, for up trending markets, create a directional position expecting implied volatility to decline. Ideally, to gain the edge it should be short more options than long to benefit from the expected declining implied volatility. However, be aware that adding a short put to a call spread increases the position risk so it needs to be carefully watched. Setting a stop limit at or above a defined lower support level should be a part of the plan unless the objective is to acquire the underlying in the event it closes below the put strike price at expiration. For defined downtrends, the plan is slightly different. In downtrends implied volatility increases as put buying pushes prices higher. In this situation, the objective is to select a directional position composed of more long options than short options to benefit from the rising implied volatility. Put ratio spreads, also called put backspreads is one of the alternatives to consider. For example, sell one out-of-the-money put and buy two farther out-of-the money puts. Alternatively sell two out-of-the- money puts and buy three farther out-of-the-money puts. Depending upon the number and strike prices selected it could be opened for a small net debit, zero, or even a credit. The risk here is when the downtrend stalls the extra long options lose time value. If an ETF using futures contracts is the underlying there can be an extra downside edge in a downtrend when the futures are in contango, and rolled monthly since they will incur losses each time when rolled into the next expiration month. United States Oil (USO) is an example. An understanding of the relationship between implied volatility and Historical Volatility offers another opportunity. Implied volatility reflects option prices based upon actual market activity using an options pricing model, while Historical Volatility also called Realized Volatility or Statistical Volatility, measures how the underlying security has actually moved in the past. Many believe implied volatility offers the best estimate of the future Historical Volatility, but in the final analysis, at expiration the movement of the underlying security is what matters, and implied volatility is often higher than warranted. In these cases, the edge goes to option sellers. On occasion, the implied volatility may be lower than the Historical Volatility indicating the options may be relatively underpriced. This is true when the lower implied volatility prices are not accurately forecasting a decline in the Historical Volatility, creating an edge for buyers of underpriced options. Using volatility charts displaying both volatility measures like those in our complimentary Basic Options or our Advanced Historical Data services these relationships are easy to estimate and should be a part of the trade plan preparation. By selecting the right option strategy in conjunction with identifying a long-term trend is one of the best ways to gain a necessary edge to produce high rates of return on invested capital while defining and limiting risk. It's necessary to have a defined edge that can be understand and managed . After paying commissions and transaction slippage, unless you can find an edge and get the odds in your favor, trading will most likely be a losing proposition. The ability to predict rising, falling or constant volatility can provide an edge. When perceived to be high, look to sell volatility and buy when it is low. Look for edge in the difference between Implied Volatility and Historical Volatility by determining if option prices are expensive or cheap relative to the movement in the price of underlying asset. As for trends, here is a thought to remember – so plan accordingly.